A strip of honey-colored fly paper spirals down from a thumbtack, anchored in midair by its now-empty canister. Speckled with lifeless flies, it swings each time the violin bow pokes it. It's very tight quarters as the string quartet plays everything from Bach and Smetana to Czech folk favorites and 1930s anti-fascism blues. The string bass player grooves like a white Satchmo — his bow sliding in and out between diners. My sweater is just in the way. I'm eating pork and potatoes in a small-town pub in the Czech Republic — Třeboň. It could be just about any small town in Eastern Europe…but definitely not Western Europe. What we think of as Eastern Europe (more correctly Central Europe) comes with old-fashioned fly paper and band leaders with big moustaches. It's changing fast...catching up to the West. But if you visit quickly, you'll catch a world with an endangered patina. The band leader plays a 100-year-old black wood flute. During a break, I finger its mouthpiece — worn like an ancient marble relic by countless nights of music-making. The flautist sports a big bushy mustache just like the Emperor — Franz Josef — who looks down from a yellowed poster above the door to the kitchen. Above the quartet is a high window. Teenage heads bob into sight — straining and craning on tiptoes to look in. Each time a song ends, beers giggle golden on rough wood tables as the roaring crowd claps and cheers for more. As the night wears on, there are fewer tourists clicking photos and more locals singing along. 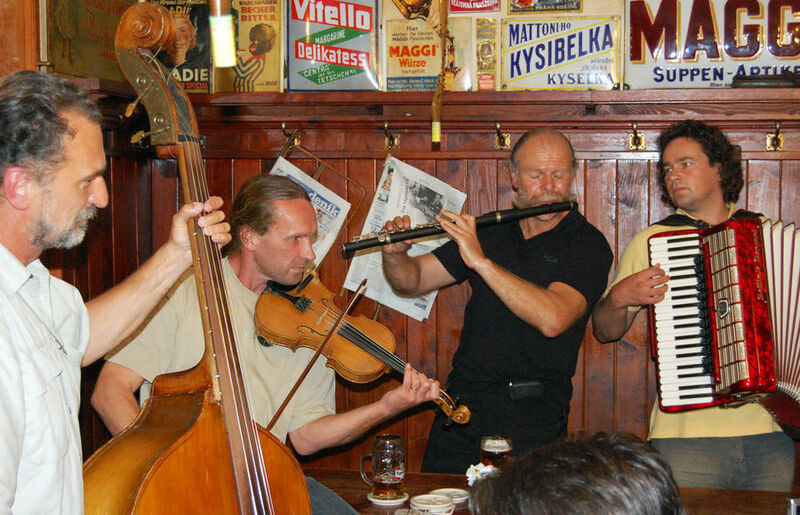 As the quartet sways together like seaweed in a nostalgic musical tide, it occurs to me that in little towns all over the world, no-name bands are causing strangers to smile...and drink more beer. Crossing the border into the Czech Republic, I stow my desire for good wine and become a beer lover. Here, beer is the default drink. It hits your table like a glass of water does in the States. On my early trips — before I learned that Czech beer is more powerful than other beers — I used to have a big beer at lunch and spend the rest of the day wobbly...sightseeing on what I called "Czech knees." Now, when in the Czech Republic, I resist a momentum-killing beer at lunch and finish each day with a fresh draft beer (tonight's is still trying to kill my momentum as I type). The man who bought me my beer noted, "These days, with the European Union opening things up, many Poles and Hungarians are going west to France and Germany to get jobs. But not the Czechs. We can't find good enough beer anywhere but here. Our beer keeps us glued to these bar chairs." Back in my hotel, I climb to my attic room — careful not to bean myself on a medieval wooden beam. (I feel like I'm sleeping in a playground structure built before the age of steel piping.) I lean out my tiny dormer window, the sound of the boisterous bar small in the distance. I am so happy for the freedom, peace, and prosperity the countries of the former Warsaw Pact are enjoying. The new, sturdy roof tiles around me are slick with a light rain. The street, wet and shiny, is as clean as a model railroad town. Cars, while not expensive, are new and parked tidy as a jukebox. The scene is lit by cheap yellow lampposts. After 40 bleak years of communism, the lampposts seem to be intentionally cheery…like a fashion accent decorating the line of pastel facades that arcs out of sight. In small Czech towns, the facades are humble but fun. Three centuries ago, each was given an individual personality — with more variety designed into them than even the famous gables of Amsterdam. And today — after a grime-filled 20th century — they sport new paint jobs: A mellow rainbow of simple solid pastels, with lines that accent their individuality. And behind each facade is a family or a shop or a bar like the one I visited tonight. I could have gone to an American-style hotel bar and nursed a drink while looking out at the pretty town square. I'd have had crisper service and more choices on the menu. And the chairs would have been certainly been more comfortable. 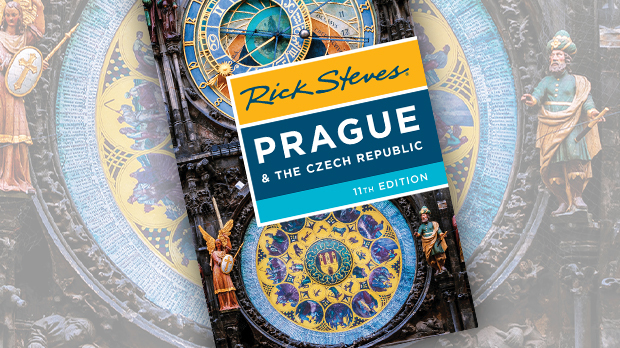 But by venturing away from the high-rent zone and the places with English menus and dodging a few vigorous string bass bows and swinging fly paper canisters, I stumbled onto memories that colored my Czech experience vividly.